Transshipment complex for grains in port area for sale. Navigation in the Port – all year round. Depth along berths – 9 m.
The land area – 1 ha (lease). Receiving grain from cars – 2,000 tons/day. 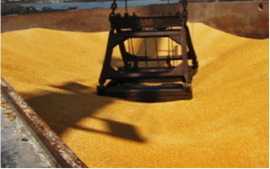 Receiving grain from wagons – 2,000 tons/day. Loading on a vessel – 3,000 tons/day. Loading of containers – 500 tons/day. Storage – up to 28,000 tons. Capacity of complex – 350,000 tons/year. Project development: allocation of land for increased capacity for the storage – up to 43,000 tons, and capacity for transshipment – up to 450,000 tons/year.